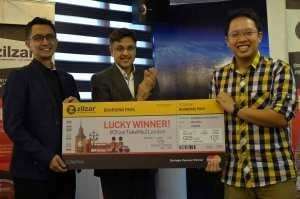 Kuala Lumpur – Zilzar Tech Sdn Bhd, an e-commerce Muslim Lifestyle Marketplace recently announced the winner of its first social media campaign named #ZilzarTakeMe2London. Ridzwan Hafidz bin Rosli from Melaka emerged as the winner, taking home a roundtrip ticket for two to London on Malaysia Airlines. “The Zilzar team was thrilled with the enthusiastic response for this engagement which saw involvement of over 1,200 participants. This was a great avenue for us to interact closely with new Zilzar users and will be the first of many future campaigns on our platform,” said Rushdi Siddiqui, Co-founder and CEO, Zilzar Tech Sdn Bhd. “Mastercard is committed to supporting and growing the Muslim Lifestyle marketplace by providing safe, secure and scalable payments capability. We are delighted to be part of this unique initiative aimed at bringing excitement to the dynamic segment,” said Safdar Khan, group country manager, Indonesia, Malaysia and Brunei; group head, Islamic Payments, Southeast Asia, MasterCard. The 4-day long campaign, which took place at the recent World Halal Summit 2015, was open to all Malaysian citizens above 18 years. The participants were asked to sign up with Zilzar and/or take ‘selfies’ at the Zilzar booth and upload it onto Facebook or Twitter with the hashtag #ZilzarTakeMe2London.